The Tokyu Fudosan Holdings Group recognizes the cooperation of stakeholders is necessary and important to ensuring proper social responses in our business activities across the entire supply chain. In particular, the real estate business of the Group largely affects communities and parties over long-term time horizons from development to operation, so it is essential that we work closely with a variety of stakeholders. Additionally, the development and operation of homes, office buildings, commercial facilities and resorts that are mindful of local community development will create business opportunities and enhance the competitiveness of the Group. It is based on this awareness that we will continue to work with stakeholders such as local governments, local communities, design firms, construction companies, and end customers to help revitalize and develop society across the entire supply chain of our businesses. The Group strives to create value for local communities and end users by actively working to reduce the environmental burdens through urban revitalization or improved access to transit or to construct buildings that have barrier-free designs for individual projects in response to the initiatives it is carrying out for social issues in the supply chain. Tokyu Land Corporation is developing a number of office building properties mainly located around major hub stations with excellent access to transit. Tokyu Land Corporation has a basic philosophy of every developing office buildings that can access public transportation. Such excellent locations near stations with quick access to transit have received high marks from tenants because of the convenience and shortened commute times they offer. These buildings also help to mitigate CO2 emissions because their location encourages the use of public transit, which has less of an impact on the environment. The Group is actively involved in urban redevelopment projects in an effort to create more appeal and attractive urban communities. One of Japan's largest terminal stations, Shibuya fulfills a role not only as a hub of transportation, but also a hub of community information and culture. 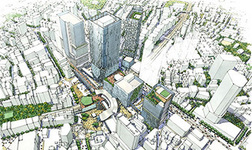 Currently, a public-private partnership is taking place to make fundamental changes to Shibuya's urban functions and Tokyu Land Corporation is a participant in this redevelopment project. 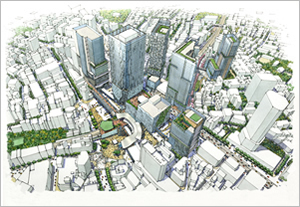 In 2027 when all redevelopment is completed and the area serves as a hub for creative contents industries and urban tourism, Shibuya will be transformed into a community that attracts even more people from Japan and abroad. Tokyu Land Corporation's office buildings adopt barrier-free and universal design concepts to ensure that people with disabilities can use facilities safely. Tokyu Land Corporation's office buildings adopt barrier-free and universal design concepts to ensure that people with disabilities can use facilities safely. The company has created the Office Building Universal Design Guidelines to ensure a standardized approach. All of its newly constructed office buildings must comply with these guidelines, while existing buildings are handled sequentially, such as when carrying out remodeling work. 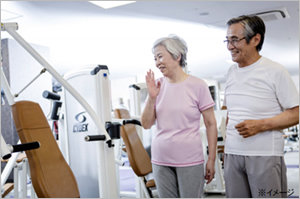 In July 2015, Tokyu Sports Oasis, Inc. began accepting heart disease patients from Nippon Medical School Musashi Kosugi Hospital for heart rehabilitation. In July 2015, Tokyu Sports Oasis, Inc. began accepting heart disease patients from Nippon Medical School Musashi Kosugi Hospital for heart rehabilitation. The company's heart rehabilitation program is carried out using preselected exercises based on a medical exam and ensures participant safety by having a physician on call to respond immediately in case of an emergency. 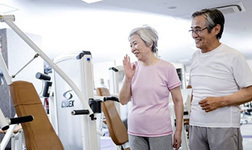 In the future, Tokyu Sports Oasis, Inc. will work with Nippon Medical School Musashi Kosugi Hospital to create an urban area heart rehabilitation program jointly run by both.